Oberstown detention centre in Lusk, Co Dublin. A DUBLIN YOUTH is facing trial charged with false imprisonment of staff members during a three-hour siege at the Oberstown detention centre for young offenders. The Dublin Children’s Court heard that four of the detention centre’s supervising staff were trapped in a room by the then 16-year-old boy. The boy, now aged 17, is charged with four counts of false imprisonment, of two males and two females, at unit 8 in the detention centre, on the night of 27 November, 2015. 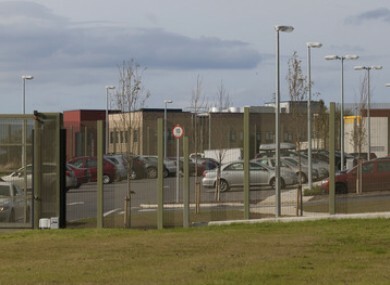 The 48-bed facility in Lusk in north Co. Dublin is the State’s main detention centre for offenders aged under 17. Judge John O’Connor asked for a summary of the facts of the case to decide on the issue of jurisdiction. Garda James O’Byrne said it would be alleged that on the night of the incident the teenager had refused to go to bed for staff. He told them he was having a “stand off”, a term in the centre for not co-operating, Garda O’Byrne said. It was alleged that the youth pulled a television set from a wall and broke it while the detention centre workers “withdrew into a staff room”. The court heard that he had also taken a broken bracket from the back of the television and used it as a weapon to damage the walls, windows and a couch. Garda O’Byrne said it would be alleged that when the staff members attempted to come out the youth threw the television in their direction which hit one of them. They withdrew back into the room and for about two and a half hours staff negotiated to put an end to the siege, the garda said adding that there was also CCTV evidence. Judge O’Connor has not yet given a ruling on whether the case will stay in the Children’s Court or instead go forward to the circuit court, which has tougher sentencing powers. The defence are to prepare submissions pleading for the trial to be heard in the Children’s Court. The boy, who was accompanied to court by an adult relative and his solicitor Michelle Finan, has not yet indicated how he will plead. Judge O’Connor said the case was quite serious and he made an order for disclosure of prosecution evidence to the defence. Finan said that there was a lot of evidence involved and she would also be seeking statements from Oberstown. The boy was remanded on bail to appear again in March. The Children’s Court can accept jurisdiction for serious offences by taking into consideration legal submissions and evidence relating to the age and level of maturity of the defendant. Email “Oberstown youth who allegedly threw TV and hit staff member is charged over siege”. Feedback on “Oberstown youth who allegedly threw TV and hit staff member is charged over siege”.